How do you make sure my information is secure? Does Best Egg give my personal information to anyone? † The Annual Percentage Rate (APR) is the cost of credit as a yearly rate and ranges from 5.99%-29.99%, which may include an origination fee from 0.99%–5.99% that is deducted from loan proceeds. Any origination fee on a loan term 5-years or longer will be at least 4.99%. The loan term and the APR offered will depend on your credit score, income, debt payment obligations, loan amount, credit history and other factors. Additionally, the APR offered is impacted by your loan term and may be higher than our lowest advertised rate. Requests for the highest loan amount may result in an APR higher than our lowest advertised rate. You need a minimum 700 FICO® score and a minimum individual annual income of $100,000 to qualify for our lowest rate. 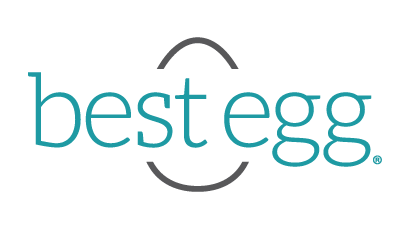 * By entering your email address, you are opting in to receive updates, notifications and special offers from Best Egg and its affiliates, agents, service providers or assignees (and any of its assignee's affiliates, agents or service providers) and, with your consent, one or more lending partners. This email address will also be used to log into your application. Best Egg loans are unsecured personal loans made by Cross River Bank, a New Jersey State Chartered Commercial Bank, Member FDIC, Equal Housing Lender. "Best Egg" is a trademark of Marlette Funding LLC. All uses of "Best Egg" on this site mean and shall refer to "the Best Egg personal loan" and/or "Best Egg on behalf of Cross River Bank, as originator of the Best Egg personal loan," as applicable. Loan amounts generally range from $2,000-$35,000. Offers up to $50,000 may be available for qualified customers who receive offer codes in the mail. The minimum individual annual income needed to qualify for a loan of $50,000 is $130,000. Borrowers may hold no more than two open Best Egg loans at any given time. In order to be eligible for a second Best Egg loan, your existing Best Egg loan must have been open for at least six months. Total existing Best Egg loan balances must not exceed $50,000. All loans in MA must exceed $6,000; in NM and OH must exceed $5,000; in GA must exceed $3,000. Barring any unforeseen circumstances, such as borrower default or payment extensions/modifications, for example: 3-year payment plans may have a minimum repayment period of zero months and a maximum of 36 months and 5-year payment plans may have a minimum repayment period of zero months and a maximum of 60 months. Borrowers should refer to their loan agreement for specific terms and conditions. A loan example: a 5–year $10,000 loan with 9.99% APR has 60 scheduled monthly payments of $201.81, and a 3–year $5,000 loan with 5.99% APR has 36 scheduled monthly payments of $150.57. Your verifiable income must support your ability to repay your loan. Upon loan funding, the timing of available funds may vary depending upon your bank's policies. © 2018 Marlette Funding. This site is published by Marlette Funding, LLC which is solely responsible for its content.